Figure 1 illustrates the sequence of calls that happens during the interface preservation process. After asking your app delegate if you want your app state to be preserved, UIKit encodes the objects currently in your app’s view controller hierarchy. Only view controllers with a valid restorationIdentifier are preserved. The preservation process walks your view controller hierarchy and recursively encodes the objects that it finds. The process starts with the root view controllers of your app’s windows, which write their data to the provided archive. If the root view controller’s data includes references to other view controllers, UIKit asks each new view controller to encode its data in a separate portion of the archive. Those child view controllers may then encode their own children, and so on. UIKit view controllers automatically encode their child view controllers, as appropriate. If you define a custom container view controller, your view controller’s encodeRestorableState(with:) method must similarly write any child view controllers to the provided archive. Set its restorationIdentifier property to nil. Provide a restoration class and return nil from the viewController(withRestorationIdentifierPath:coder:) method. Excluding a view controller prevents that view controller from being saved in the archive. It also excludes all of the view controller’s children from being preserved. Register the object while your app is running by calling the registerObject(forStateRestoration:restorationIdentifier:) method of UIApplication. For example, you might register a configuration object immediately after creating it. 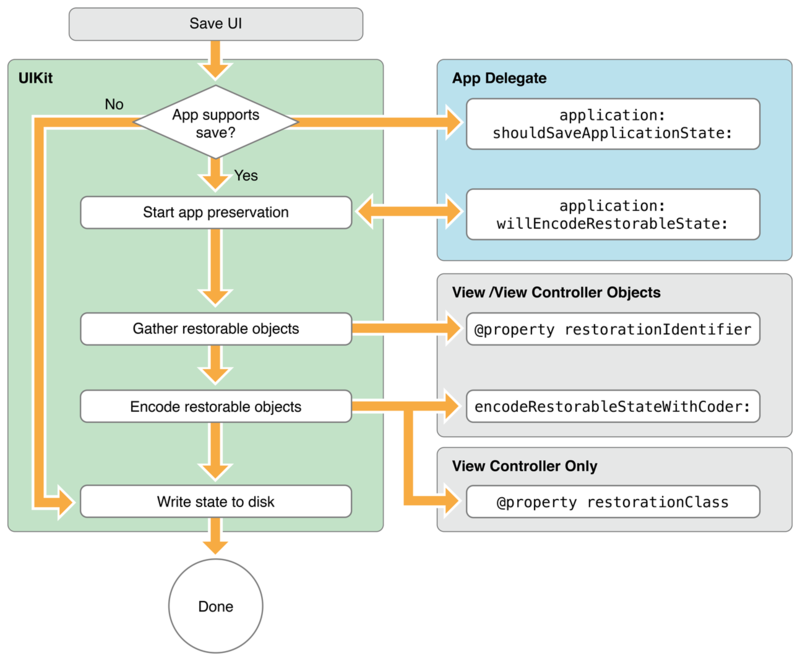 In one of your encodeRestorableState(with:) methods, encode the object into the restoration archive. You can also encode it in your app delegate’s application(_:willEncodeRestorableStateWith:) method. You can encode any data you want for your custom objects, as long as it is sufficient to return that object to its previous state during the next launch cycle. Encode data that is not crucial to your app’s behavior, and never encode data that should be persisted in other ways. For example, do not encode your app’s settings or user data that must persist between launch cycles.